In this book Peter Burke adopts a socio-cultural approach to examine the changes in the organization of knowledge in Europe from the invention of printing to the publication of the French Encyclopédie. 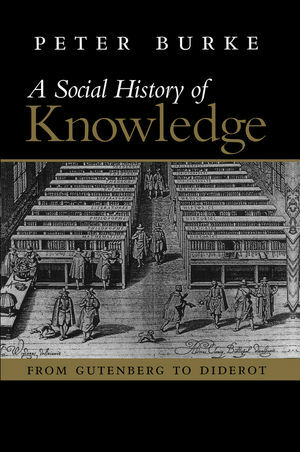 The book opens with an assessment of different sociologies of knowledge from Mannheim to Foucault and beyond, and goes on to discuss intellectuals as a social group and the social institutions (especially universities and academies) which encouraged or discouraged intellectual innovation. Then, in a series of separate chapters, Burke explores the geography, anthropology, politics and economics of knowledge, focusing on the role of cities, academies, states and markets in the process of gathering, classifying, spreading and sometimes concealing information. The final chapters deal with knowledge from the point of view of the individual reader, listener, viewer or consumer, including the problem of the reliability of knowledge discussed so vigorously in the seventeenth century. One of the most original features of this book is its discussion of knowledges in the plural. It centres on printed knowledge, especially academic knowledge, but it treats the history of the knowledge 'explosion' which followed the invention of printing and the discovery of the world beyond Europe as a process of exchange or negotiation between different knowledges, such as male and female, theoretical and practical, high-status and low-status, and European and non-European. Although written primarily as a contribution to social or socio-cultural history, this book will also be of interest to historians of science, sociologists, anthropologists, geographers and others in another age of information explosion. Asa Briggs is Chancellor of the Open University and Provost of Worcester College, Oxford. Peter Burke is Professor of Cultural History at the University of Cambridge and Fellow of Emmanuel College, Cambridge. 1. Sociologies and Histories of Knowledge: an Introduction. 2. Professing Knowledge: the European Clerisy. 3. Establishing Knowledge: Institutions Old and New. 4. Locating Knowledge: Centres and Peripheries. Classifying Knowledge: Curricula, Libraries and Encyclopaedias. 6. Controlling Knowledge: Churches and States. 7. Selling Knowledge: the Market and the Press. 8. Acquiring Knowledge: The Reader's Share. 9. Trusting and Distrusting Knowledge; a Coda.